The lunch wagon evolved into the modern day diner as it got bigger and became stationary. At the same time some lunch wagon manufacturers, Buckley in particular it would seem, embraced then new automotive technology, modernizing lunch wagons by making them self propelled. Though the diner manufacturers seem not to have continued in earnest with this evolutionary line, self propelled lunch wagons are all over the place today, out of the backs of box trucks or built up on the frames of pickups. 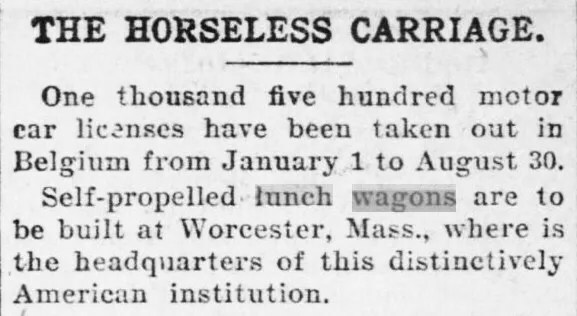 I’m not sure as to the manufacturer on this, but its lunch wagon lineage is clear. Ornate and looks very heavy. 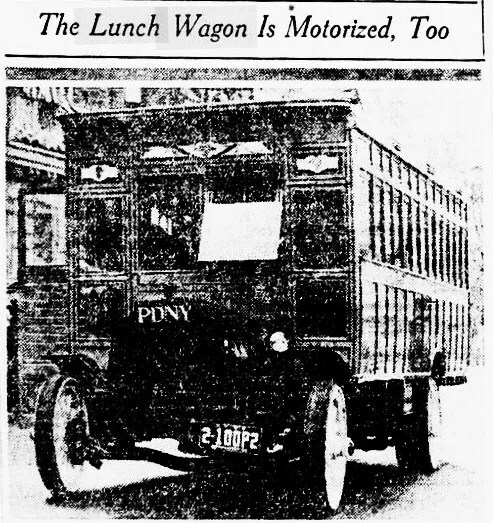 This entry was posted in Diners / roadside related, Diners/ restaurants, Worcester and tagged 1900, 1901, 1902, 1903, 1904, 1905, 1919, Buckley, chain drive truck, electric car, electric lunch car, electric lunch wagon, electric truck, MA, Mass., motor lunch wagons, New England Lunch Wagon Company, pdny truck, pony truck, stanley steamer, steam engine, T.H. Buckley Co., T.H. Buckley Manufacturing Company, T.H. Buckley Night Lunch Company, trolley, trucks, United States Lunch Wagon Company, white house cafe, Worcester, WWI by Spencer Stewart. Bookmark the permalink. Spencer, this is an amazing find. Kudos! !